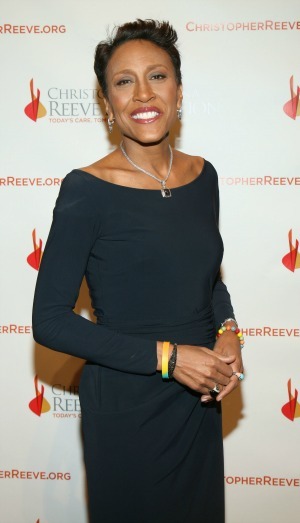 Robin Roberts may be one of the most intriguing figures on TV, and she’s excited for what 2014 has to offer. Robin Roberts has gone from her lowest low to her highest high, all in the last few years. The Good Morning America anchor was diagnosed with a rare blood disorder in 2012 and underwent a bone marrow transplant and long road to recovery. She took time off from her job, and lost her mom at the same time. Since recovering, Roberts officially came out and introduced the world to her longtime girlfriend, Amber Laign, who helped her healing process. The 53-year-old GMA host told America on Monday morning, Jan. 6, that things are now going in the right direction for her. “I have never been happier or healthier than I am right now,” Roberts said via People. After the bone marrow transplant, Roberts recovered at home but finally returned to Good Morning America in February. Not only does Roberts feel physically healed, she has been working on healing emotionally. Roberts’ girlfriend, as well as her friends and coworkers, have been important in that process. That year-end statement was posted on Facebook Dec. 29, 2013. In the post, she thanked not only Laign, but also God, her doctors and her sister (who was also her donor), for “giving me the gift of life.” The date was an important one for Roberts because it was one year since the 100-day post-transplant milestone, and the day her dog KJ was allowed to come home.